How Does It Aid Enlightenment? Danburite crystals have a sweet and pure vibration, with a highly spiritual vibration that gently yet powerfully opens the crown chakra, then links and attunes it with the heart chakra. This combination activates the intellect and higher consciousness from a heart based perspective. All colors of this stone are amazing vehicles for enlightenment and spiritual growth. 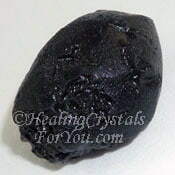 They are worthwhile healing crystals for you to put to use in meditation as they have a high vibration that may aid contact with angels and your spirit guides. 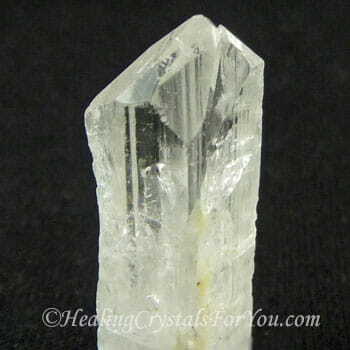 How does this crystal aid enlightenment? 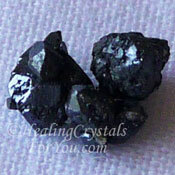 They are healing stones with an energy that is extremely uplifting to the spirit. It may activate the higher etheric transpersonal chakras, right up to the fourteen level, and this is known to aid enlightenment. 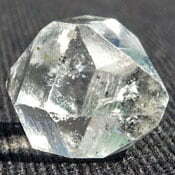 Danburite was originally discovered in Danbury, Connecticut, USA, and the meaning of its name relates to that original find. Deposits have been found in Mexico, as well as in Japan, Burma, Russia and Madagascar. It has an interesting and unusual prismatic configuration. 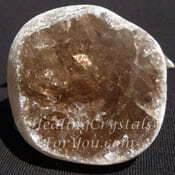 Danburite crystals come in a range of colors and all have a powerful energy to assist your life. 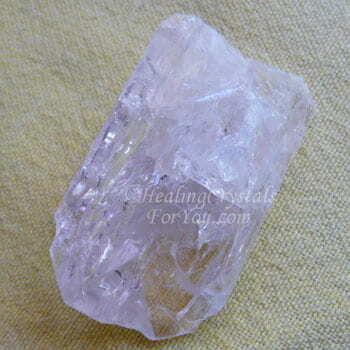 This crystal may be clear and colorless, pale pink or golden yellow. 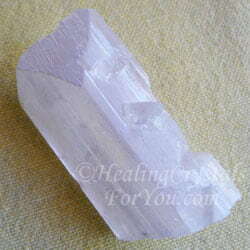 The newest color is the beautiful angel aura crystals. 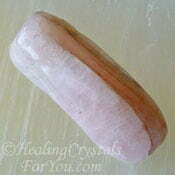 Allow your intuition to guide you as to which colored stone will be most helpful. Occasionally within the crystal you may see a Buddha formation. It is said that this formation may promote enlightenment and bring through an increase of spiritual light. 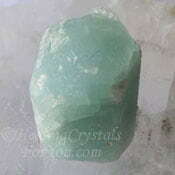 The embodiment within this healing crystal of the higher aspects of enlightenment and self love may assist in smoothing the path ahead of anyone who uses such a crystal. Riotous feelings and attitudes caused by misunderstandings may be eased by its energy. Its vibration may also bring through a deep sense of patience and peace of mind. Using this beautiful crystal in meditation may take you to a higher state of consciousness where you may make contact with your spirit guides and access their teaching. 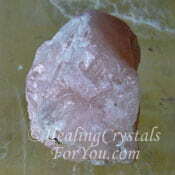 Pink Danburite is particularly useful to use for meditation. 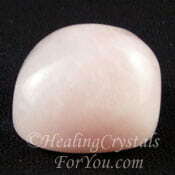 The pink variety is a heart chakra stone with highly beneficial metaphysical properties. 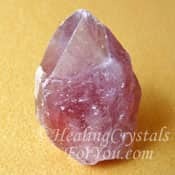 These pink crystals not only resonates at the heart chakra, but its energy is particularly strong within the thymus chakra, which is also known as the higher heart chakra. Using it in this way may assist the emotional body to bring about emotional healing and release anxiety. The vibration of this lovely crystal resonates with the angelic realms, and is capable of bringing the harmony from that realm down into the heart. 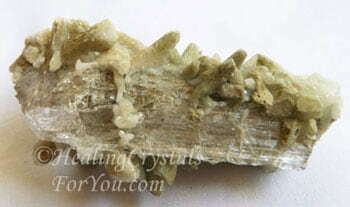 Shop for pieces of genuine Danburite at Exquisite Crystals, my most reliable crystal seller. Extraordinary change can happen as its use allows you to let go of past karmic created conditions that you have brought with you to this life. If you connect with your higher self you may move forward in a new direction. 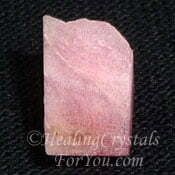 This is a potent soul star chakra stone that may also aid you with inter-dimensional travel. 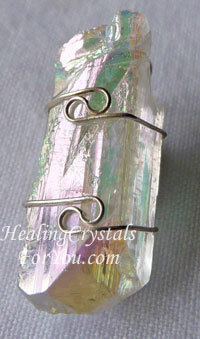 These high vibration crystals encourage the heart to resonate with Divine love which also promotes self love. These crystals have an ability to calm down the mind, which is a wonderful gift. Learn easy meditation ideas and techniques, and combine this with using these crystals. An increase in compassion, love and a much greater feeling of happiness may be the result. 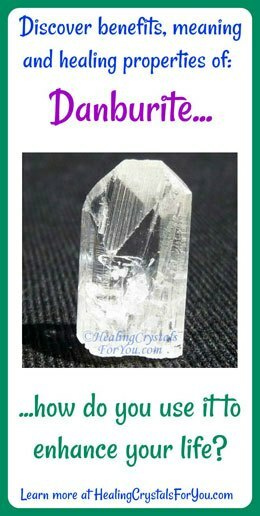 It is fairly easy to buy pieces of Danburite from specialist crystal suppliers, and it is usually possible to obtain this crystal fairly easily. Wearing this stone on your body as jewelry makes it easy to keep its energy within your auric field during the course of the day. These crystals help you by opening your heart fully to the Divine source, so you may find yourself becoming more in tune. And you may become truly enlightened, something that is surely needed in these interesting times in which we are living. 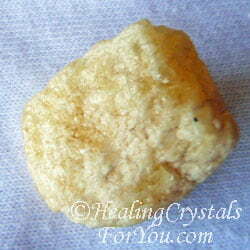 They have a wonderful energy to aid emotional healing. 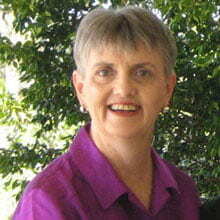 They will also assist you to let go of fear and anxiety and help you if you are suffering with grief. 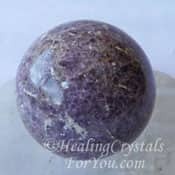 They are powerful for those of you who experience stress and worry, and provide excellent methods to relieve stress. Using it may aid healing of family conflict by promoting peace and harmony. Golden Yellow Danburite connects you to the sweetness of etheric music. Their fine high vibrations are intensely uplifting. They will help you to connect to the universal mind and will aid you with contacting angels. 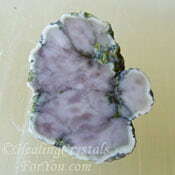 Another wonderful gift that this stone gives us is to use it for lucid dreaming. To lucid dream is to be very aware of what is happening while dreaming, almost as if you are awake. 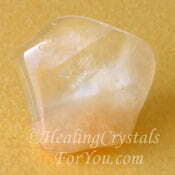 Many people who use this crystal will find that they remember the dream as if it actually happened. The amount of awareness varies from person to person. It may also heal the muscular structure of the body. 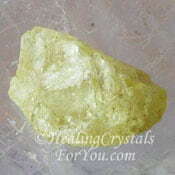 As a healing crystal it is a powerful stone to clear allergic conditions. It has a strong cleansing and detoxifying action, as it works through the liver to remove unwanted toxins. If difficulty with sleeping is your problem, holding one in each hand should allow you to calm the mind chatter of a busy day and slip into restful sleep. Combine Scolecite or Seraphinite with it and the experience of lucid dreaming will be even more profound. 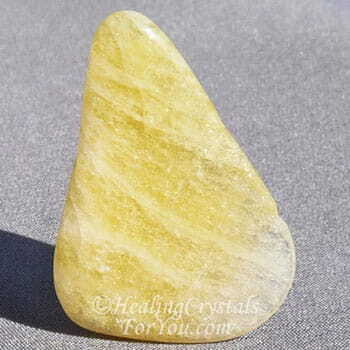 To aid you to make a deeper connection with the golden light and to Christ consciousness, use the Golden variety in meditation, with Nirvana Quartz, also known as Lemurian Scalar Quartz. Twin Danburite crystals like the one on the left, are formed when two of these stones grow together. These are excellent stones to aid relationships. 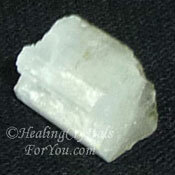 The healing of the emotions that is aided by these crystals, is one of its greatest healing attributes. It may assist you to heal any relationship problems as you begin to live from your heart. 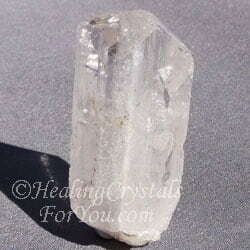 A good idea is to place a piece of this crystal on your bedside or under your pillow at night, so that the energy will benefit you for as long as possible. 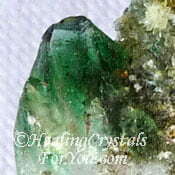 You may also find these crystals made into jewelry, as these stones are on the zodiac birthstones list as they are a Leo birthstone. There is a new color and slightly different type of this crystal that has become available, which is known as either Opal Aura or Angel Aura Danburite. Either name is correct, and this is when the clear crystals have been put through the same procedure that is used to create Blue Aqua Aura Quartz. They use the same minerals that are used to create Angel Aura Quartz or Opal Aura Quartz, which are different names for the same aura quartz crystal. The way they do this, is that they heat the crystal, and during this process, vaporized silver and platinum become permanently bonded to the surface of the stone. This procedure creates quite beautiful crystals, with an opalescent sheen that have some different qualities to the normal clear color of these crystals. I chose to get a piece that had been made into a pendant, as I felt it is beneficial to keep it on your body, and what better way than wearing a pendant. 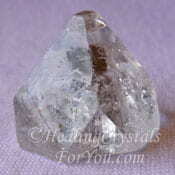 You may be pleasantly surprised to find that using the Opal Aura Danburite crystal has a quite profound effect on you. 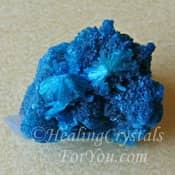 They assist you in letting go of fear and they are helpful crystals to relieve stress. Used in meditation they can take you to a very high level where some people experience out of body effects. 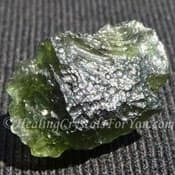 You may feel much lighter and more peaceful afterwards, and if like many others you have found that you are going through a tremendous amount of spiritual change at this time, you could find that this crystal may benefit you. 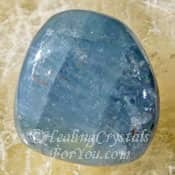 The main differences between the Angel Aura crystals and the normal clear stones is that they assist you to make an even higher connection to the higher realms, and to the angelic beings there. This coating is said to help with spiritual growth and awakening, and is another tool that you may choose to use to aid this ongoing situation. "We cannot do great things in this world, we can only do small things, with great love." Mother Theresa. 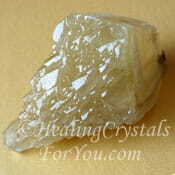 The piece shown above is Clear Danburite with golden quartz growing on it. 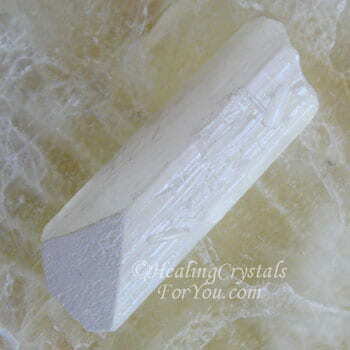 This is an unusual stone that will resonate powerfully, as the quartz has a strong ability to amplify energy. 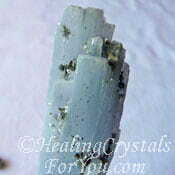 A good way to use any color of Danburite is with some of the other high frequency stones. Those that are used with this stone with impressive results are Petalite, Scolecite, Celestite, Tanzanite, Herderite, Moldavite, Herkimer Diamonds, Brookite, Phenacite, Stellar Beam Calcite, Tremolite, Natrolite, Clear Apophyllite, Tibetan Tektite and Satyaloka Quartz. 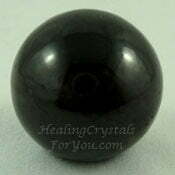 Also combining it with the other very high vibration stones will further create a more intense healing result. 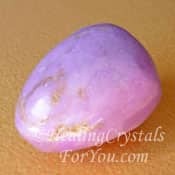 All colors of this stone resonate well with the other pink stones which strengthen its vibration within the heart chakra. 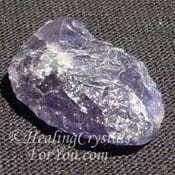 To aid stress, combine it with Lilac Lepidolite, Phosphosiderite, Aquamarine or Kunzite. 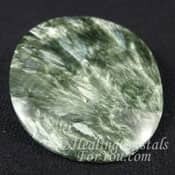 If you are having trouble coping due to feelings of grief, you may like to use it with stones such as Apache Tears, Aquamarine, Datolite, Diopside, Morganite, Spurrite, Tugtupite, Cavansite and Lepidocrocite. Crystals that work well combined with it include Angel Phantom Quartz, Phosphosiderite, Variscite, Pink Tourmaline, Amblygonite, Pink Petalite, Lithium Quartz, Crocoite, Rose Quartz Crystal, Lilac Lepidolite or Morganite. 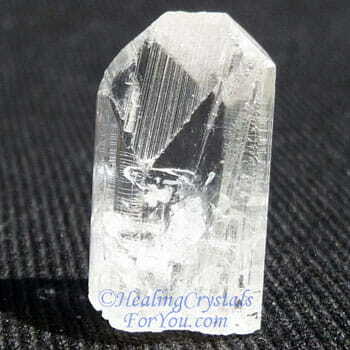 It will also combine and harmonize well with Aqua Aura Quartz and with Prasiolite, also known as Green Amethyst. 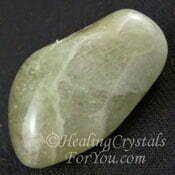 Prasiolite is also a heart chakra stone, and when combined with Danburite will aid lightbody activation. This combination also creates a lovely spiritual connection to nature, as does combining it with Angel Phantom Quartz aka Amphibole Quartz, Angel Wing Blue Anhydrite, Elestial Quartz or Seraphinite, lovely stones that also aid the angelic connection. 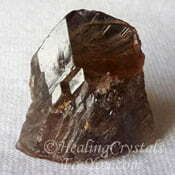 For inter-dimensional travel combine it with Elestial Calcite and Merkabite Calcite. 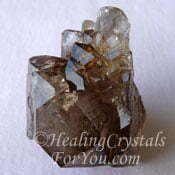 For grounding you spiritually, combine Axinite Crystals or Smokey Quartz with it. To aid the strength of the health benefits, combine Golden Danburite with both Lilac Lepidolite and Shungite, which is a powerful stone to aid a variety of health conditions particularly allergy.